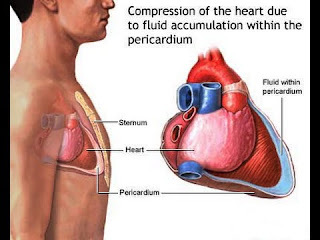 Cardiac tamponade is the accumulation of excess fluid within the pericardial space, resulting in impaired cardiac filling, reduction in stroke volume, and epicardial coronary artery compression with resultant myocardial ischemia. Clinical sings of cardiac tamponade depends on the rapidity of the fluid accumulation and on the fluid volume. Risk factors include recent cardiac trauma such as open trauma to the thorax (gunshot wounds and stabs), closed trauma to the thorax (impact of the chest on a steering wheel during a motor vehicle accident), cardiac surgery, and iatrogenic causes (cardiac catheterization or pacemaker electrode perforation). Nursing Diagnosis: Decreased cardiac output related to reduced ventricular filling secondary to increased intrapericardial pressure. Continuously monitor ECG for dysrhythmia formation, which may result of myocardial ischemia secondary to epicardial coronary artery compression. Monitor the BP every 5 to 15 minutes during the acute phase. Monitor for pulsus paradoxus via arterial tracing or during manual BP reading. Monitor urine output hourly; a drop in urine output may indicate decreased renal perfusion as a result of decreased stroke volume secondary to cardiac compression. Assess cardiovascular status: monitor for jugular vein distention and presence of Kussmaul’s sign. Note skin temperature, color, and capillary refill. Assess amplitude of femoral pulse during quiet breathing. Assess level of consciousness for changes that may indicate decrease cerebral perfusion. Review ECG for electrical alterans. Review echocardiogram report if available. Provide supplemental oxygen as ordered. Initiate two large-bore intravenous lines for fluid administration to maintain filling pressure. Pharmacologic therapy may include dobutamine to enhance myocardial contractility and decrease peripheral vascularresistance. Monitor the patient for dysrhythmias, coronary artery laceratio. Surgical intervention to identify and repair bleeding site, to evacuate clots in the mediastinum, to resects or open the pericardium. Vital signs are within normal ranges (RR: 16-20 X / min). Monitor strictly vital signs, especially respiratory frequency. Rationale: Changes in breathing patterns can affect vital signs. Monitor the contents breathing, chest expansion, regularity of breathing, mouth breathing and muscle use a respirator. Rationale: The development of the chest and use accessory muscles indicate breathing pattern disorders. Give the semi-Fowler position if not contraindicated. Teach clients a deep breath. Rationale: With the deep breathing exercise can increase oxygen intake. Rationale: Oxygen adequate to avoid the risk of tissue damage. Rationale: Medications that can affect the respiratory ventilation.